Small footprint industrial vacuum with fixed tubing network simplifies housekeeping, reduces equipment wear and tear and eliminates trip hazards. It used to be that the value of industrial hygiene equipment was measured solely in the reduction of incident-related and workers’ compensation costs. Today, those measurements include impacts on the manufacturing process where shaving seconds from a single process can have a huge impact. In fact, simply shaving 3.2 seconds from a task can reduce direct labor costs by $29,000 per year according to ASSE’s ROI of Ergonomic Improvements: Demonstrating Value to the Business. Shaving seconds from a cleaning operation not only saves direct labor costs, it also results in increased uptime. Industrial vacuum systems have become critical elements in an organization’s ability to maintain comfortable profit margins by contributing to increased product quality, reclaiming materials and reducing wear and tear on equipment, which means less repair costs, less downtime for maintenance and, in turn, longer production runs. Although using vacuums isn’t new to industry, many companies have used shop-type vacuums instead of heavy duty industrial vacuums to clean up dust and debris, and have found them inadequate under the harsh demands of the industrial environment and non-compliant with safety and combustible dust standards. In rugged industrial applications where environmental safety, ergonomics and productivity matter, vacuum cleaners designed specifically to withstand rigorous 24/7 operation can deliver consistent performance that adds to a company’s bottom line. Powerful industrial vacuums deliver three times the vacuum rating of the highest rated shop-type vacuums on the market today, cover more area, and pick up finer material. What once took users 2.5 to three hours can now be completed in less than half the time speeding up overall productivity. 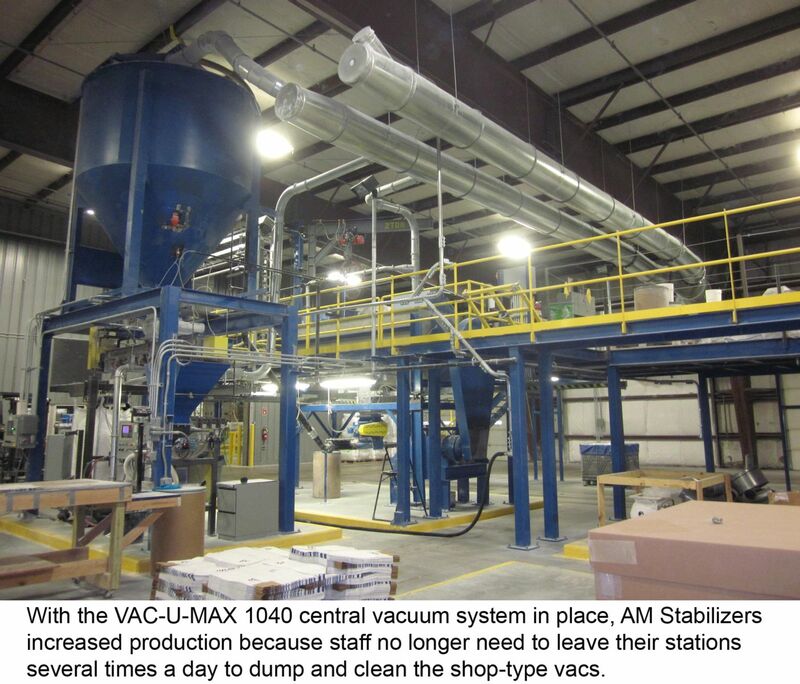 Frustrated with workers dealing with cords and cleaning filters on shop-type vacuums that needed to be emptied often, Mike Justice, Plant Superintendant at Valparaiso, Indiana-based AM Stabilizers began researching industrial vacuums. AM Stabilizers is a global supplier of high quality liquid and powder heat stabilizers for both flexible and rigid PVC applications. 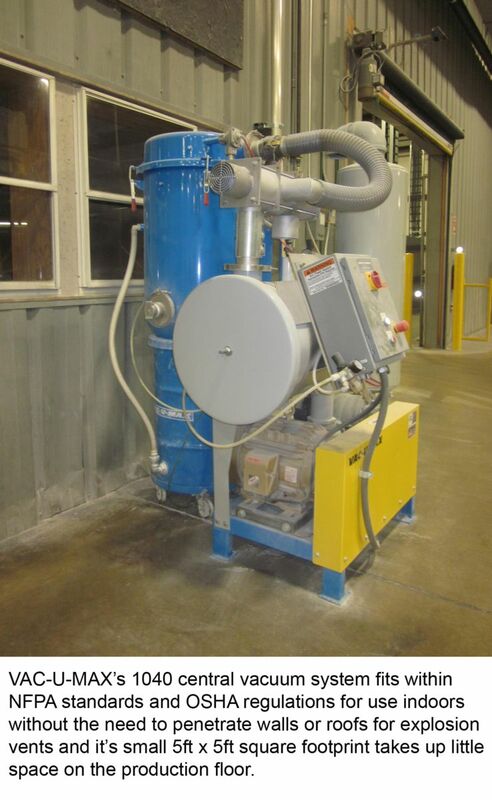 The Valparaiso plant produces powder stabilizers by blending raw materials and then packaging the finished product into a variety of containers based on customer’s needs including valve bags, boxes, drums and 1500-pound super sacs. A traditional central vacuum system appeared to be the ideal solution to a cleaner environment and elimination of trip hazards that cords and vacuums created on the shop floor, but they can also be cost prohibitive for smaller organizations, often requiring outdoor air permits as well as construction permits. Stationary central vacuum systems are ideal for environments requiring continuous 24/7 operation and the simultaneous use of up to 20 pickup points. These systems employ powerful vacuum producers and high-efficiency filters connected to strategically placed piping throughout a facility connecting hoses to a common line. While attending a trade show, Justice was able to witness VAC-U-MAX’s model 1040 stationary industrial vacuum, which was perfect for his operation. Belleville, NJ-based VAC-U-MAX, pioneer in industrial vacuum cleaning and pneumatic conveying industries for over 60 years, has application expertise in the handling of over 10,000 bulk materials including powders, flakes, granules, pellets, fibers, capsules, gel caps, tablets, and various other bulk materials. The company manufactures industrial vacuum cleaners for manufacturing and municipal facilities as well as government installations and environmental sites to improve cleanliness, working conditions and safety. Consulting with an expert industrial vacuum cleaning manufacturer often results in off-the-shelf solutions that are custom fitted with accessories to meet a customer’s housekeeping and budgetary needs. The unit that Justice saw at the show features a powerful positive displacement pump designed specifically for high volume recovery (up to 5 tons per hour) and can support up to three operators at one time. Because the system’s filter separator and collector (a.k.a. “dirty volume”) are less than 8 cu ft, it fits within NFPA standards and OSHA regulations for use indoors without the need to penetrate walls or roofs for explosion vents. The entire unit is grounded and bonded and is fitted with static-conductive filters per NFPA 77 for use with combustible, non-metallic dusts. The compact central vacuum system avoids much of the installation costs and delays of a traditional central vacuum system with its plug-and-play design and complete UL-certified control panel, while still providing the convenience of a multi-inlet central vac, allowing multiple users in simultaneous operation. “It is small and compact enough with a 5ft x 5ft square footprint that it sits right at the side of our production line. It isn’t in the way of anything,” says Justice. Justice set up 10 strategically placed pick up points throughout the facility, spanning two floors, with the bulk of them in production, a couple in the warehouse to handle raw materials spills, one near a mixer, and another out by the loading docks. He also made sure that there were several sets of hoses throughout the facility ensuring no one needed to drag hoses around in key areas. “VAC-U-MAX provided several types of cleaning tools with the hoses, from vacuuming the floor to real thin angled pieces to get you into the corners and the nooks and crannies. It is all lightweight aluminum so it is light and easy to handle,” says Justice. “It is a great unit. It is a huge perk for us to be able to change from electrical cords and vacuums everywhere to where we just plug in with a 1.5 inch hose and vacuum up what we need right away,” says Justice. Instead, the unit is equipped with a 30-gallon drum that is dumped at the end of each shift into a containment box that is managed by an industrial waste management company that disposes of it according to environmental regulations. 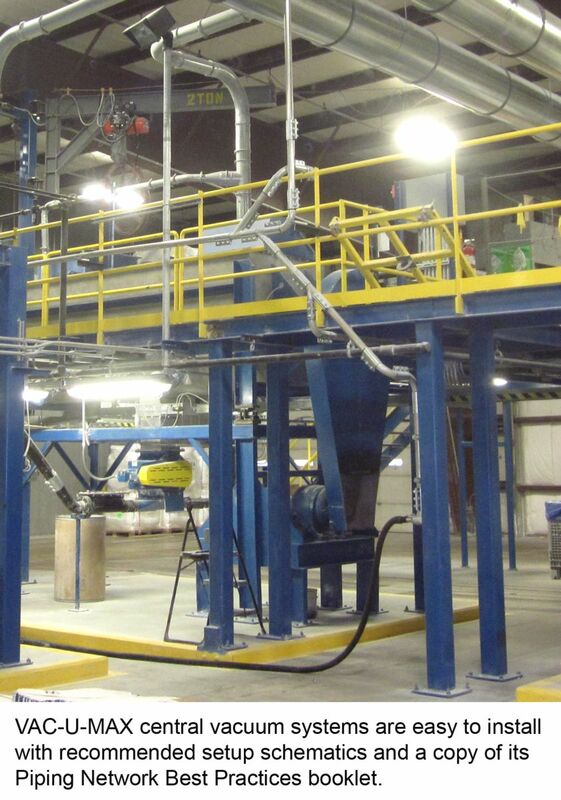 The vacuum manufacturer also offers additional material handling choices for collected debris. When asked about any surprises, aside from the increased performance, with the system or its installation, Justice noted that the quietness of the system came as a surprise. The 1040 system is equipped with noise mufflers and guards so sound levels are less than 79 dbA, below OSHA’s limit for an 8-hour period. “We still don’t have to require hearing protection and that is a big benefit,” he says. “I would recommend this VAC-U-MAX system to anyone who does small manufacturing and has a lot of dust and debris they need to clean out,” Justice says. For more information or to discuss your application Contact Us.